Dep. DNC chair Keith Ellison elected Minnesota AG despite domestic abuse allegations and past ties to anti-Semitic Nation of Islam. Minnesota congressman and Deputy Chairman of the Democratic National Committee Keith Ellison (Minnesota-5th) was elected Attorney General of Minnesota on Tuesday, defeating Republican Doug Wardlow, a former state lawmaker. Preliminary results show Ellison defeating Wardlow 49% to 45%. In the run-up to Tuesday’s vote, the election had been seen as competitive in the Democratic-leaning state, in part due to a string of controversies dogging Ellison. 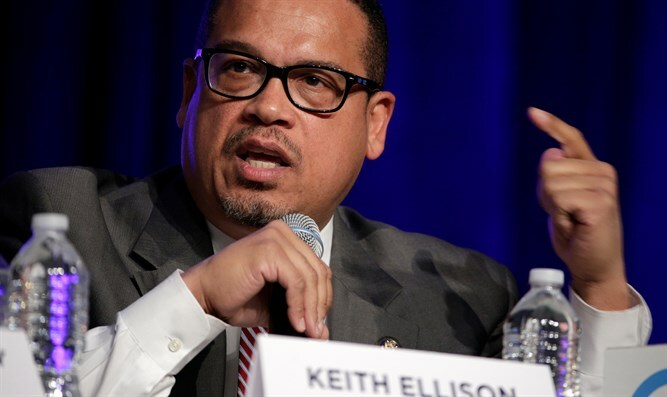 In August 2018, Ellison was accused by former girlfriend Karen Monahan of domestic abuse – claims Ellison denied. While an internal probe by the Minnesota Democratic party found no evidence to back up Monahan’s claim, critics noted that the attorney who led the investigation had close ties to the local Democratic party, and is a partner at a firm which donated heavily to Minnesota Democrats – including Keith Ellison. Ellison has also faced criticism for his past ties with the radical Nation of Islam organization in Chicago, and support for its controversial leader, Louis Farrakhan. Condemned by the US Senate in a unanimous vote for anti-Semitic comments, Farrakhan compared himself favorably to Adolf Hitler in 1984, described Judaism as a “gutter religion”, referred to Jews as “termites” last month, and has repeatedly accused American Jews of practicing “Satanism”. Earlier this week, Farrakhan led a chant of “Death to Israel, death to America” at an event in Tehran marking the 39th anniversary of the takeover the American embassy in Iran. While Ellison has played down his ties to the Nation of Islam and support for Farrakhan, according to a report by the left-wing Mother Jones, Ellison backed Farrakhan at least into the late 1990s, and only distanced himself from the Nation of Islam leader during a congressional run in 2006. Ellison himself was accused of peddling anti-Semitic canards during a 2010 gathering. In an audio recording publicized by the Investigative Project on Terrorism, Ellison can be heard accusing Israel, through elements of the American Jewish community, of dominating the United States. In response, ADL head Jonathan Greeblatt slammed Ellison, accusing him of peddling in “age-old stereotypes”. In 2016, Israeli-American businessman and Democratic donor Haim Saban called Ellison “an anti-Semite” – a claim Ellison explicitly denied. A year later, former Harvard Law professor Alan Dershowitz warned that he would bolt the Democratic party if Ellison was elected DNC chairman, citing Ellison’s past ties to the Nation of Islam and controversial statements on Jewish influence in America.